This is something a little new for me. I'm branching out slightly from my usual books and sharing with you some of my favourite bookish candles. Every month or so (or whenever I burn something new) I'll post a little review and some information about the candle. Wizard's Beer! A truly scrumptious scent inspired by Butterbeer the popular wizarding beverage in Harry Potter. The fragrance is a rich buttery, creamy vanilla scent (there's a hint of rum and maple thrown in too!) all of which makes for a beautifully velvety, butterscotchy delight! I have to admit, I bought this on a whim. It was there in the sale section, I was buying some candles anyway, and I was curious. 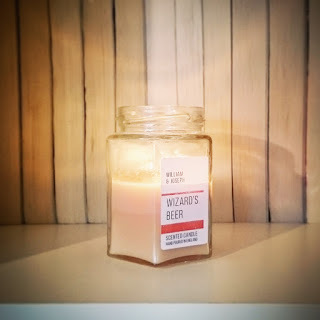 I've bought a lot of bookish candles from William and Joseph in the past, so I was confident in the quality of the product.
. It's perfect for Harry Potter fans and anyone looking for a comforting scent for their home. The scent throws really well, and even unlit can provide a subtle fragrance in my bedroom. It's quite a warming scent, and makes any room it is flickering away in smell amazing. The scent carries well too, and when it's burning I can smell it in every room of the house, and that scent lasts for perhaps two hours after the candle is extinguished. On the first burn I left it going for two hours, which was plenty of time for the wax pool to form a nice even layer across. The wax melts easily which is fantastic at preventing tunnelling, but it doesn't burn off very quickly so the candle lasts for a long time. Being a glass candle, it provides a lot of light too, creating a lovely ambience in the room. I haven't had to trim the wick of this candle often, only a little bit off when I first opened it and once since - it burns very efficiently. 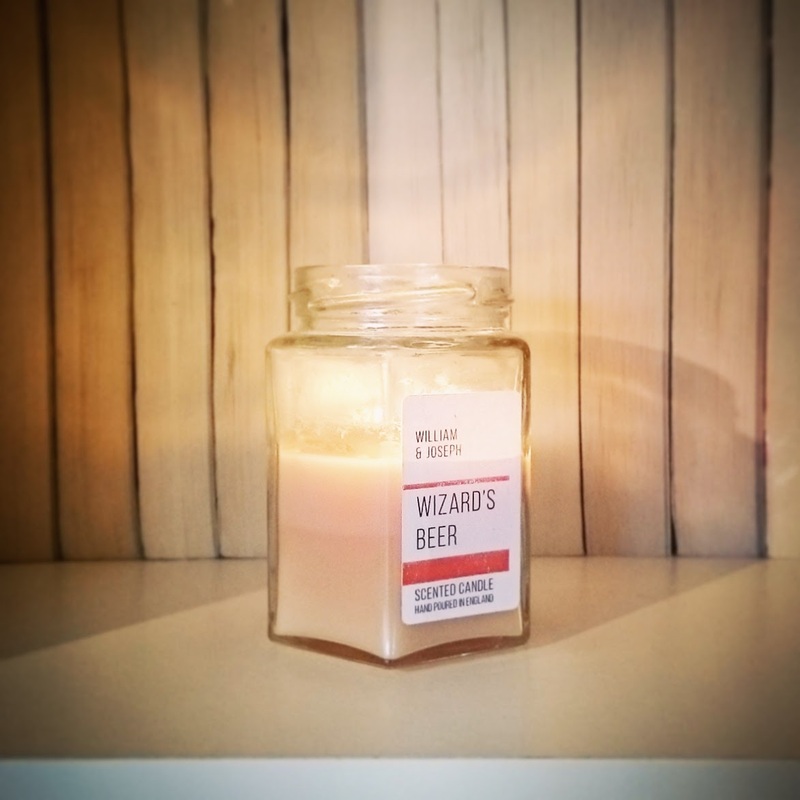 I like to keep my wick a maximum of 5mm, so I find that with some candles it feels like I trim them every time I burn them, and I was so pleased that this wasn't the case with Wizard's Beer. The jar candle is part of a discontinued range, but you can still buy this scent in a tin for the same price, and I definitely will be buying another when this one burns down. Omg wow, I absolutely have to get this! Thanks for introducing me to this cool brand! I feel like I can almost smell it! Yummy! This sounds like it smells lovely. I'm always overly tempted by candles and end up with 30 sitting in the closet unburnt every time I move. Still really want this one, though. This is adorable! I still dream about the butterbeer I had at Wizarding World years ago... and it's nice that this is a pretty, high-quality candle on top of being such a cute scent.